When it comes to cocktails, I like to have one well-crafted drink and stick to it, than to continually mix it up all evening. However, I also love giving readers as much information as I can about the possibilities as I can. The latter leads to be having a lot of flights of things… not that I’m complaining! There are, of course, the times when you can well-crafted and flights, and those times make everyone happy. One such space where you can find both is the Hollywood Brown Derby Lounge. Here I decided to give their martinis flight a spin. Actually, the carousel the three drinks come on looks as if you could give it a spin like a roulette wheel if you wanted to! Although I don’t recommend this strategy unless you want to have your evening cut short by getting yourself, and you dining companion, covered in martinis. 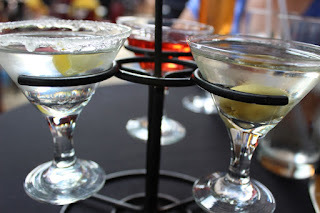 While a classic martini is gin and vermouth, with vodka commandeering a piece of the martini market in the 1950s, guests of the Hollywood Brown Derby Lounge are treated to three very different styles of martinis. The flight comes with a Classic Gin (Hendrick’s Cucumber and Rose Petal Infused Gin and Dry Vermouth), Citrus Vodka (Absolut Citron Vodka, Cointreau, and Simple Syrup), and Derby Cosmo (Absolut Pear Vodka, Grand Marnier, and a splash of Cranberry Juice). Each is strikingly different from the others, but tasty in their own right. The Classic Gin is precisely what you would expect. While you would be forgiven in thinking that the cucumber and rose petal infusion might take away from the traditional flavors of the gin martini, I found them to be very faint and only present in the background, adding a bit of freshness not often present in the cocktail. It isn’t mentioned in the menu description, but the Classic Gin does come with the standard accoutrement of green olives. The Citrus Vodka is less a martini, save for the glass it comes served in, and more an oversized lemon drop shot. In fact, it comes complete with a sugared rim! This drink will make you pucker, but it isn’t the lemon, but rather the sweetness that will do it to you. This sugary nature of this concoction is clearly meant to hide some of the stronger alcoholic components of this drink. Those of you who like sweet cocktails would enjoy the full-sized version of the Citrus Vodka. For my palate, I’d only really consider it if I would looking for a dessert-type cocktail. Last, but not least, is the Derby Cosmo. The Cosmopolitan has been around, at least in popular culture, since the 1970s, with variations dating back decades before and no shortage of variations since. The changes made to the Derby’s iteration do not drastically change the composition of this strong cocktail. A hint of fruit, citrus in particular, and the twinge of cranberry give the Derby Cosmo just a hint of something new and something old fashioned, much like the Hollywood Brown Derby itself. The good news from the martinis flight is that there is truly something for everyone. The other side of that coin is that it is likely to find that at least one of the three will disappoint. My suggestion, unless you just have to try them all like I do, is to pick the one that speaks most strongly to you and never look back. Be a classic, something with a modern touch, or a bit of fun. 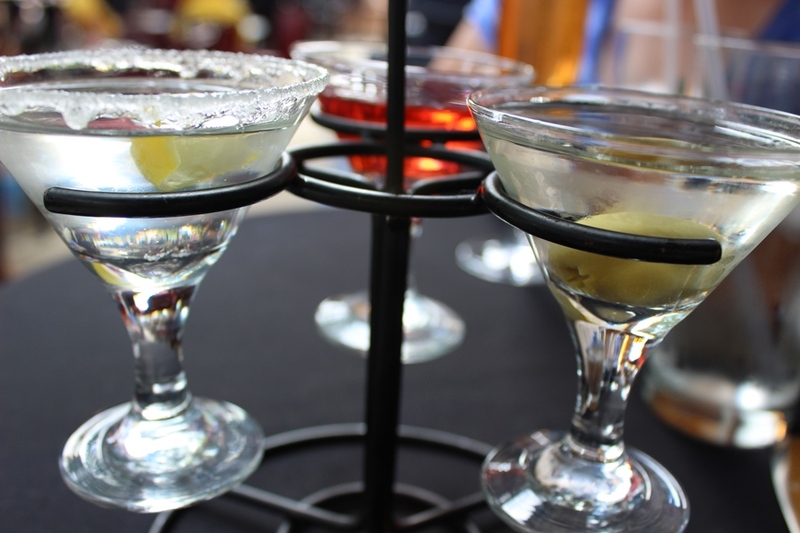 It doesn’t matter which you choose to imbibe with, all of the martinis from the Hollywood Brown Derby Lounge are well-crafted and can be just what you are looking for! I saw the flight of margaritas last week. I'd already ordered my Gin Gin Mule, so I had to wait for another time.